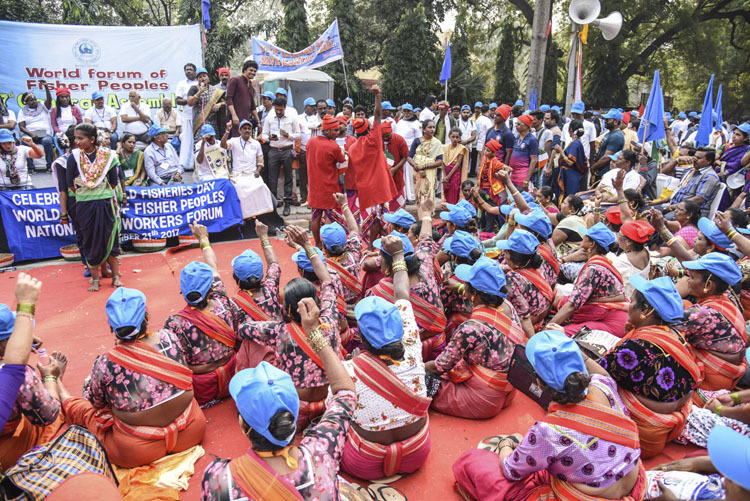 The fishworkers from across ten coastal states of India and 45 countries from all over the world celebrated the World Fisheries Day by marching through the Parliament Street. The National Fishworkers Forum (NFF) invited international delegates of World Forum of Fisher Peoples who had been in Delhi from 15th of November to be part of the rally. 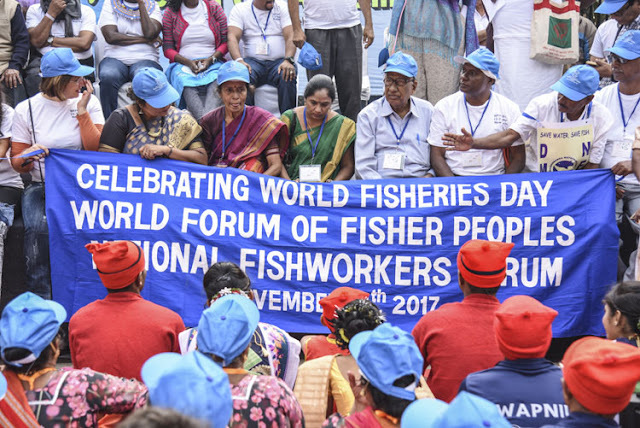 The WFFP delegates shared that it was the twenty year anniversary of November 21st, 1997, the day on which WFFP was first initiated in Delhi and when the forum declared the date as World Fisheries Day. It is a matter of pride that today many countries around the world celebrate it as the same. Nadine Orchid Nembhard (Gen. Sec., WFFP) declared the fishworkers from across the world will unite and resist ocean grabbing and will fight for the rights of traditional small scale fishworkers, especially women. 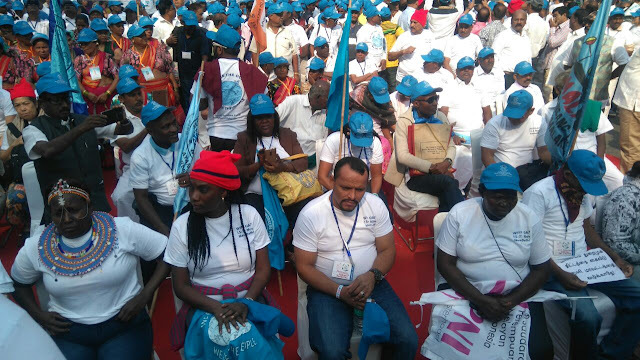 The outgoing Gen. Sec of WFFP Naseegh Jafar (South Africa) addressed the gathering and said that the fishworkers of the world declared to the people doing ocean grabbing that their time is over. Christiana Louwa (Co-coordinator WFFP, Kenya) asserted the need to resist bad policies and projects that affect the livelihood of people and fight for their rights and dignity. Moesis(Honduros) thanked everyone for the amazing success of the WFFP GA-7 and said that they will fight for traditional women and young fishworkers of the world. Paula Martins de Barros Gioia (La Via Campasina, Germany) wished everyone from the peasants across the world and asserted the need to globalize our struggle and our hope. 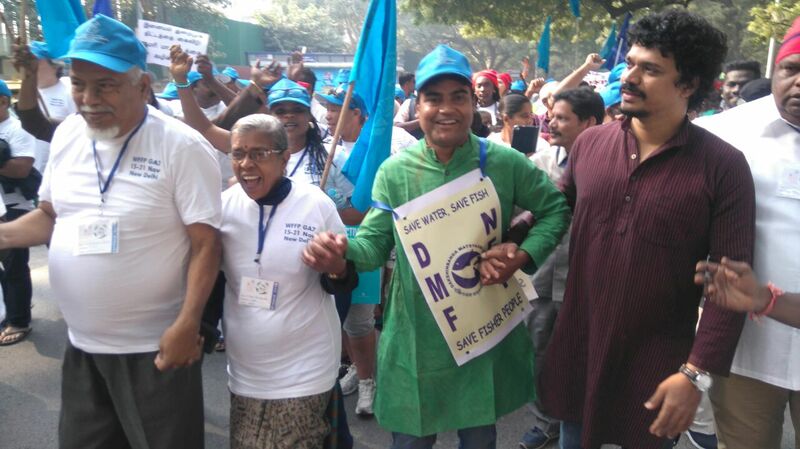 Janardhan Tambe (NFF, Maharashtra), the 94 year old freedom fighter, stated that he is overwhelmed to see the sea of blue on the streets of Delhi and shared his hope to see them all together like this when he is 100 as well. T. Peter (Gen. Sec., NFF) added that NFF will strengthen the struggle at the grass root level in the fight against ocean grabbing through the government policies. 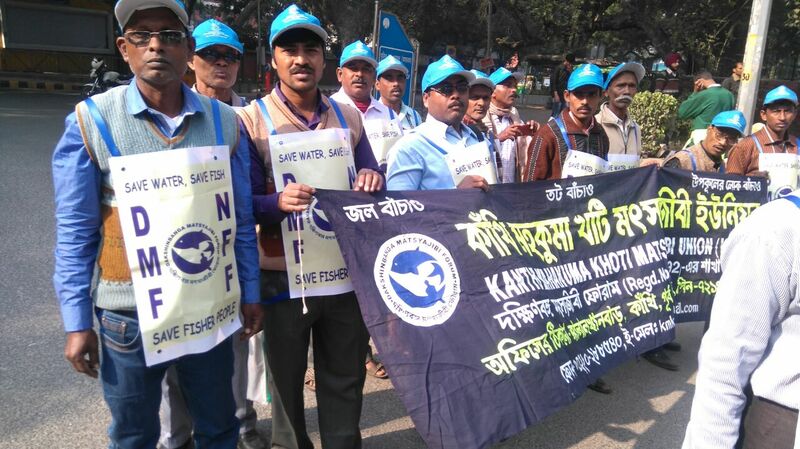 NFF leaders such as Leo Colaso (WFFP India; Maharastra), Debashish Shyamal (West Bengal), Olencio Simoes (Goa), Ravi Kiran (Maharastra), Vasudev Boloor (Karnataka), PP John (Kerala), K Allaya (Orissa), Jesu Rethinam (Tamil Nadu), Milan Das (West Bengal), Debashish Paul (Andra Pradesh) and Shailesh (Gujarat) addressed the gathering. The rally also saw cultural performance by Murasu Kalai Kuzu and Kohli Dance performance from Maharashtra. 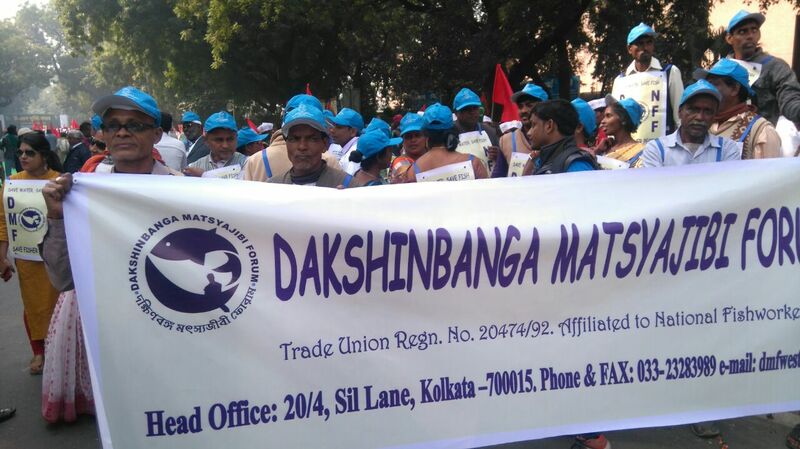 Dakshinbanga Matsajibi Forum president Mr. Debasish Shyamal told that, hundreds of fishermen from west bengal also participate in the event and marching on the rally.